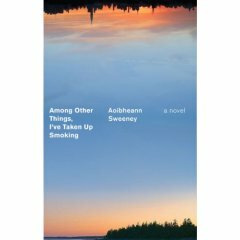 Among Other Things, I’ve Taken Up Smoking, by Aoibheann Sweeney is an enjoyable read; I breezed through it in just a couple of days, which is unusual for me. Which is not to say that it’s light reading, necessarily, just that it’s a book I was happy to spend hours with. My copy came recently as a review copy from Penguin.The novel tells the story of Miranda, a young girl who lives first on an island in Maine with her father and later, after she finishes High School, in Manhattan. Her mother died somewhat mysteriously when she was three, leaving Miranda and her father on their own, although they are joined at times by Mr. Blackwell, a friend from the town across the bay. The father is working on a translation of Ovid’s Metamorphoses, but as time passes, it becomes clear that this is a project that will probably never be complete. It is a pretense of work that keeps him occupied and give him a reason to live in such isolation. About the first quarter of the book takes place in Maine, covering Miranda’s entire childhood, and then her father arranges for her to work at the Institute for Classical Studies in Manhattan amongst old friends of his. Once there, she struggles to make her way in a strange city and to absorb the new information she learns about her parents, and also about herself. Miranda’s relationship with her father is one of the novel’s central story lines; the father spends most of his time lost in his studies and has no practical sense and little skill in maintaining a household, and so Miranda, with the help of Mr. Blackwell, learns early how to cook and care for the house and how to navigate across the bay on her own to get to school. She learns how to type so she can type up her father’s manuscript. She spends so much time alone with her father and devotes so much time to caring for him, and yet he is emotionally remote, caught up in the past and living with secrets that Miranda discovers only when she goes away. The tales in Metamorphoses rarely ended happily; the process of transformation, of hands turning into claws and feathers sprouting on shoulders, was sometimes a punishment and sometimes a reprieve. But mostly it was a compromise of some sort, a way to negotiate the chasm between desire and mortality, between human nature and human need. There are many mysteries in the book — what exactly happened to Miranda’s mother? why is her father so reclusive? what exactly is the nature of his relationship to Mr. Blackwell? — some of which get resolved and others of which don’t. One of the most intriguing mysteries for Miranda is the mystery of desire itself — what it is and what it makes people do. As in all first-person narratives, the pleasure of the reading lies in the reader’s response to the storyteller. Miranda speaks with a voice that is vulnerable and questioning, but there’s a toughness too, and even a kind of reticence — her life has not been easy, but she doesn’t spend her energy mourning it so much as trying to understand it. The book was a pleasure to read — smart and meditative, with a narrator that enjoyed spending time with. I liked this, too! And then when I mentioned that on my blog I learned via a comment that a local friend and blog-reader studied in Paris with the author. Yes, a friend who now lives in Grangeville, Idaho. Small world, eh? I look forward to more from Sweeney. I loved the sound of this – I really want to read it, only, I’m afraid the father might be me!! I’m so glad you liked this (I skimmed the post quickly, trying not to take in too much information) because I have a copy waiting to be read. I really didn’t know what to expect so “smart and meditaive” and “a pleasure to read” makes me eager to get to it! Sounds fabulous. And how can I possible resist a book set in both Maine and Manhattan?! I’m psyched (yes, that’s right, psyched – apparently I’m returning to my eighth grade vocabulary today) to read this now that you’ve reviewed it…the NYtimes review was sort of luke warm, I thought. Diana — I read your blog religiously, but I missed your mention of Sweeney’s book — I shall have to seek it out! Litlove — oh, no, no worries there! You are not like the father at all, and I think you’d like it. Jenclair — I can’t wait to hear what you think! Emily — exactly. The Maine section is beautiful, and the Manhattan one is fun — it made me want to go there directly. Courtney — I read that review in the NYT and didn’t agree with its lukewarmness — I didn’t find Miranda “complacent” at all; rather, I thought she was curious but also afraid of what she might find — afraid of the world, and rightly so. Stefanie — sorry about that 🙂 You’re right that smoking is the last thing I need! I think this sounds interesting too. I was too late to get a copy from Penguin, but I added my name to the library queue, so hopefully I won’t have to wait too long. So glad to hear you enjoyed it. I also love books set in NY and Maine (I have always wanted to go to Maine for some weird reason…). Danielle — I’ve never been to Maine and yet I’m not all that far (relatively speaking). The descriptions of her Maine island are wonderful.